Replacing windows and doors in Florida can be a more complex process than other areas in the U.S. Florida has very specific and enforced building codes that pertain to the performance of windows and doors. 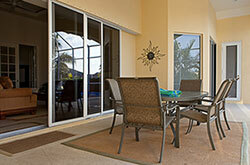 Many FL coastal regions require window and door openings to be protected against hurricanes. Our building expertise includes an extensive understanding of window and door products and how they perform. We will take the time to explain what products are best for your home that provide the best hurricane protection as well as energy efficiency.